Why is measles so con­ta­gious? The measles virus infects the upper res­pi­ra­to­ry tract. At first, a case of measles looks and feels like a com­mon cold. It makes­peo­ple cough and sneeze. As a result, they can eas­i­ly spread the measles virus­to oth­er peo­ple. You can catch the measles by breath­ing in a room where anin­fect­ed per­son had coughed an hour or two before. Why is measles so seri­ous? Measles starts out as a res­pi­ra­to­ry infec­tion, but then it attacks the immune sys­tem. The white blood cells that are sup­posed to kill the measles virus end up mak­ing extra copies of the measles virus. As a result, many of the macrophages are killed off. These are the white blood cells that are your first line of defense against infec­tion. Measles also kills off the B mem­o­ry cells. As a result, it eras­es your immune system’s mem­o­ry of how to fight dis­eases it has seen before. How seri­ous can measles be? A case of measles can lead to an inflam­ma­tion ofthe brain (encephali­tis) which can lead to blind­ness, deaf­ness, men­tal retar­da­tion, or even death. Like AIDS patients, peo­ple who have just had measles are at risk for oppor­tunis­tic infec­tions, such as pneu­mo­nia. If chil­dren who are too young to be vac­ci­nat­ed catch measles, they are at risk for a chron­ic measles infec­tion of the brain, called sub­a­cute scle­ros­ing panen­cephali­tis (SSPE). Cas­es of SSPE always progress slow­ly to coma and death. There is no effec­tive treat­ment. How can measles be pre­vent­ed? Since measles is so high­ly con­ta­gious by air­borne droplets, vac­ci­na­tion is the only effec­tive way to pre­vent the dis­ease. Two dos­es of the measles vac­cine pro­vide about 99% pro­tec­tion against catch­ing the measles. The measles vac­cine is com­bined with the mumps and rubel­la vac­cine into the MMR shot. This shot is a “live” vac­cine that can­not be giv­en to peo­ple with a sup­pressed immune sys­tem. For this rea­son, we need to vac­ci­nate prac­ti­cal­ly every­one else. Can we dri­ve measles to extinc­tion? In the 1970s, a world­wide vac­ci­na­tion cam­paign drove small­pox into vac­ci­na­tion. A sim­i­lar cam­paign has dri­ven polio to the edge of extinc­tion. Like small­pox and polio, the measles virus occurs only in human beings. Once we vac­ci­nate enough peo­ple world­wide to stop the cir­cu­la­tion of the virus, the measles will go extinct for­ev­er. After that, we won’t need tovac­ci­nate any­one against measles. Med­ical doc­tors do a real­ly good job at pre­vent­ing and treat­ing infec­tions dis­ease. Many anti­vac­cine activists sell over­priced vit­a­mins over the Inter­net. Nev­erth­less, vac­cines drove small­pox into extinc­tion. Polio is near­ly extinct. 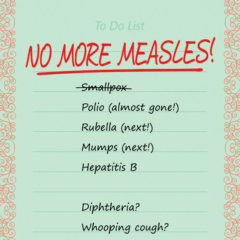 Measles is next on the list for erad­i­ca­tion. Once a dis­ease is extinct, you no longer need to vac­ci­nate against it. Vac­cines are used to pre­vent seri­ous dis­eases that cause seri­ous ill­ness and may cause dis­fig­ure­ment, dis­abil­i­ty, or death, despite the best avail­able treat­ments. Vac­cines are used against dis­eases that can get past the innate immune sys­tem. The innate immune sys­tem pro­vides gen­er­al­ized pro­tec­tion against any germs. Vac­cines give a head-start to our adap­tive immune sys­tem. The adap­tive immune sys­tem pro­vides spe­cif­ic pro­tec­tion against some­thing that the body has seen before. 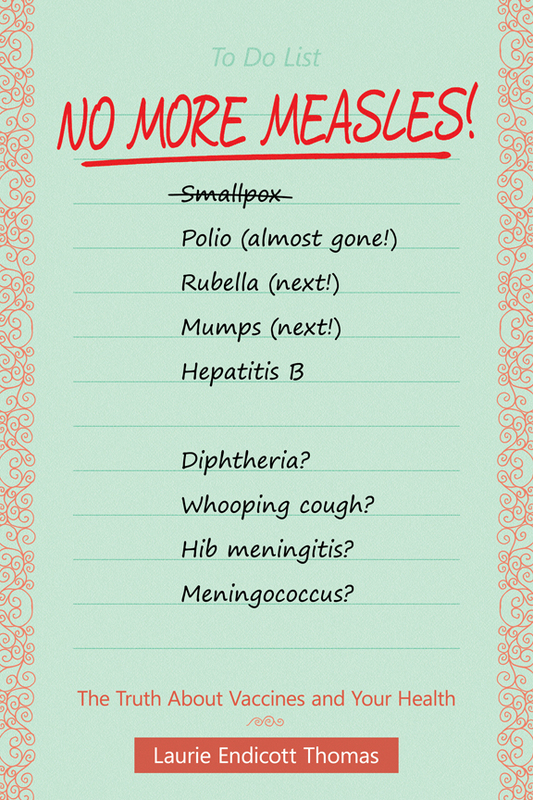 Smallpox is gone. Polio is almost gone. 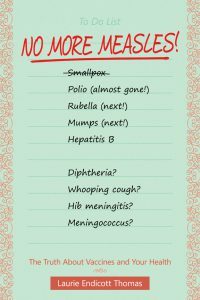 Measles is next.